Cool green forest view, secluded and private bungalow! This bungalow at Jeffry Surf House have three unit rooms. It shares the property includes a large common area deck, swimming pool and is a quiet respite from the beach front and roadside noise and activities. The bungalow can accommodate up to 14 guests. Swimming pool and lounge area, upper deck, enclosed garage for 1 vehicle or several scooters. Surf lessons, guiding & equipment is all available on site. 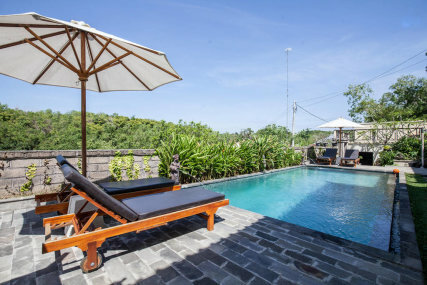 Sitting just off the main road of Jalan Uluwatu, you can be anywhere on the Bukit Peninsula within 20 minutes. There are many restaurants and small stores within a 5 to 10 minutes drive, and excellent seafood at Padang Padang Breeze restaurant just at the end of the driveway! Imagine surfing 3 of the best waves in the world within minutes from your door, Uluwatu, Padang Padang, Thomas and Bingin are all that close by. If you want to learn, the perfect beginner spot is even walking distance at Baby Padang Padang beach where surf guides and board rentals are available. Some of the premier waves in the whole world as well as some of the most beautiful coastline in all of Bali is right here. Amazing ocean views and spectacular sunsets daily! From the access driveway and out to the main road to the left is Thomas and Uluwatu beaches, to the right the famous Padang Padang beach and Bingin beaches. Either direction offers café’s, warungs and small stores for shopping. This 3 bedroom unit has 2 bathrooms, one in the master bedroom and one common bathroom. The kitchen/living room/dining area is about 16 square meters in size. From our location you can be anywhere on the Bukit Peninsula within 20 minutes. There are many new choices of restaurants, convenience markets and shops within a kilometer either direction, and excellent seafood at Padang Padang Breeze BBQ Restaurant just at the end of the driveway! Imagine surfing 3 of the best waves in the world within minutes from your door; Uluwatu, Padang Padang and Bingin are all that close by! If you want to learn, the perfect beginner spot is even walking distance close at Baby Padang beach where surf guides and board rentals are available. This 2 bedroom unit shares a common bathroom and about 18 square meters living room/dining/kitchen area. From our location you can be anywhere on the Bukit Peninsula within 20 minutes. There are many new choices of restaurants, convenience markets and shops within a kilometer either direction, and excellent seafood at Padang Padang Breeze BBQ Restaurant just at the end of the driveway! Imagine surfing 3 of the best waves in the world within minutes from your door; Uluwatu, Padang Padang and Bingin are all that close by! If you want to learn, the perfect beginner spot is even walking to distance close at Baby Padang beach where surf guides and board rentals are available. We provide Airport Transfers from and to Bandar Udara Internasional Ngurah Rai and they can be booked in the booking steps. Year round Surf destination. April to November is the dry season and most popular time. Jan-Feb expect heavy afternoon rains but still plenty of surf and less crowds. Bali benefits from an almost endless supply of Southern Ocean groundswell meaning you are very rarely disappointed. SW swells wrap around the Bukit peninsula creating an array of world class lefts including the infamous Uluwatu which is Bali's most consistent wave. It is for the more experienced surfers and it tends to section when it's smaller which does spread the crowds out by allowing take offs almost anywhere down the line. The wave is broken down into three sections, Inside corner, Racetracks and Outside corner. Further down the Bukit peninsula you can find Padang Padang which is home to Bali's most desired barrel and a more chilled out Bali surf holidays place to stay than the busier Kuta. It is a beautiful white sandy beach with reef out back for the more advanced, while in front it is perfect for beginners. Bingin reef is a fun short tube wave, that can get crowded. Dreamland beach is next in line and is one of the more user friendly beaches on the Bukit. It runs from deep water and can often be a shore break where you need to avoid creasing your board or hitting one of the many tourists playing on the inside. Balangan is slightly more secluded with another perfect looking left point. It fires when the swell direction is big enough and coming from the right direction. For beginners & intermediates there are many quality beach breaks around including the long beach break in the centre of Kuta and up to Legian. Further north west is Canggu which has a better mix of beginner, intermediate and advanced waves than the high performance waves on the Bukit Peninusla. On the east side of the island you can find Nusa Dua, Sanur & further up Keramus. This side of Bali tends to work better in the Wet season (October to April). Across from the Bali Peninsula is Grajagan or G-Land. A much more remote spot than the rest of Bali, surrounded by thick jungle and wild animals. It is often referred to as the best wave in the world. A long very consistent wave with a variety of different sections. but mostly for experienced surfers. The guest will be charged 30% of the total price if they cancel after reservation. This payment is non-refundable at any time. In case of late cancellations (less than 45 days before arrival) or no-shows, customers will be charged 100% of the booking. Hello to all! We are Vanda and Charlie! Me, myself who is the agent and on line host to our accommodation partners, loves Bali as much as Charlie my partner! Charlie restore and modify old motorcycles for a hobby as well as surf as much as he can. My hobby is cooking Indonesian food and enjoy seeing Charlie surfing on the beach.